Wahzhazhe is a contemporary ballet that mesmerizes audiences from the first beat of the rhythmic drums to the final curtain close. With powerful storytelling, audience members of all ages are moved by the story that unfolds in front of them. Featuring Miki Kawamura, Principal Dancer for Oklahoma City Ballet, Wahzhazhe is a contemporary ballet that tells the story of the Osage people. Written, directed, choreographed, produced and danced by members of the Osage Nation, it truly is a story told by those who live it. Legendary singer-songwriter Graham Nash is a two-time Rock and Roll Hall of Fame inductee-with Crosby, Stills, and Nash and with the Hollies. He was also inducted into the Songwriter's Hall of Fame twice, as a solo artist and with CSN, and he is a GRAMMY Award winner. Nash’s passionate voice continues to be heard in support of peace, and social and environmental justice. Lake Street Dive are a fascinating blend of influences and complexity: jazz at heart, with an alternative D.I.Y. sensibility and a passion for classic rock and garage aesthetics. August in Santa Fe would not be the same without the return of the “high octane” Daniel Ulbricht and world-renowned New York City Ballet principals and soloists who make up Stars of American Ballet. This year in addition to live music, these athlete-artists will perform two distinct, exhilarating programs. Santa Fe Chamber Music Festival presents the Serkin & Orion String Quartet. Santa Fe Chamber Music Festival presents Liebeslieder Waltzes. Santa Fe Chamber Music Festival presents the Dvorak String Sextet. Santa Fe Chamber Music Festival presents Schumann-Ruders-Smetana. Santa Fe Chamber Music Festival presents Vivaldi-Boccherini-Bach. Santa Fe Chamber Music Festival presents the Schubert String Quartet. Santa Fe Chamber Music Festival presents Peter Serkin and Dover Quartet. 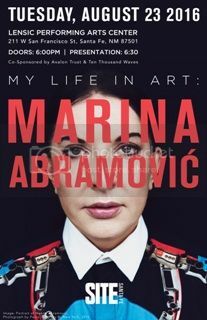 Since the beginning of her career in Belgrade during the early 1970s, Marina Abramovic has pioneered performance as a visual art form. The body has been both her subject and medium. Exploring her physical and mental limits in works that ritualize the simple actions of everyday life, she has withstood pain, exhaustion and danger in her quest for emotional and spiritual transformation. From 1975–88, Abramovic performed with the German artist Ulay, dealing with relations of duality, before returning to solo performances in 1989. Recent performances include The House With The Ocean View at Sean Kelly Gallery, New York, in 2002, and the performance 7 Easy Pieces at Guggenheim Museum, New York, in 2005. In 2010, Abramovic had her first major U.S. retrospective and simultaneously performed for over 700 hours in The Artist is Present at Museum of Modern Art, New York. The Lensic and National Theatre Live Present "The Audience". A special encore broadcast! Nominated for three Tony Awards, "The Audience" sees Helen Mirren reprise her Olivier-winning performance as Queen Elizabeth II, following her Academy Award win for the same role in "The Queen." This encore screening of the original West End production of "The Audience," captured live in London in 2013, features an exclusive Q&A with Stephen Daldry and Helen Mirren. 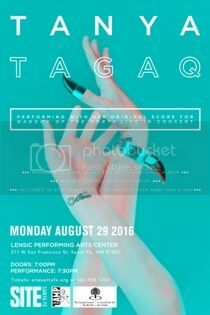 Though rooted in Inuit throat singing Tanya Tagaq’s music has as much to do with electronica, industrial, and metal influences as it does with traditional culture. Here, Tagaq reclaims the controversial 1922 silent film Nanook of the North—considered the world's first major work of nonfiction filmmaking—which portrays the lives of an Inuk family in Arctic Canada. Its director, Robert Flaherty, lived and worked with Inuit for years but still included feigned scenes of Inuit buffoonery and ignorance of modern accoutrements. Working with composer Derek Charke, percussionist Jean Martin, and violinist Jesse Zubot, Tagaq performs a live accompaniment to the film.